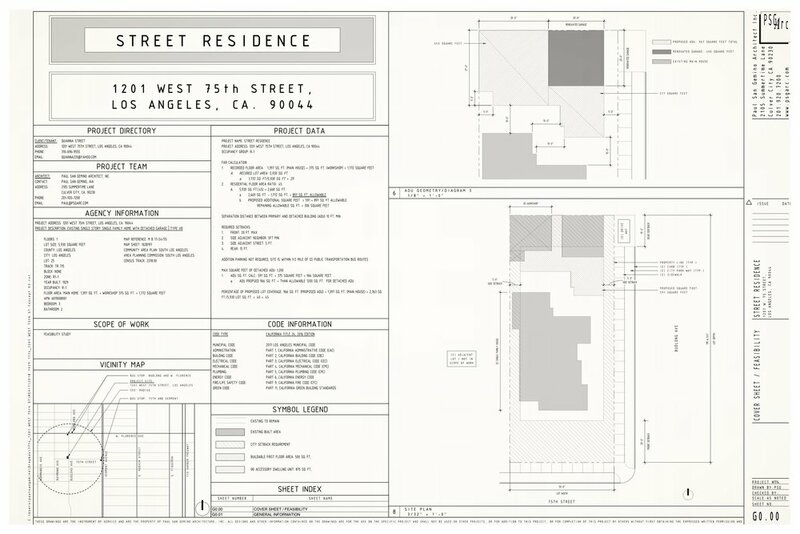 Feasibility - Street Residence — Paul San Gemino Architect, Inc. Duration to complete: This feasibility investigation and graphic presentation deliverable took approximately 3 days. Our task from the client is to present a graphical diagram explaining the remaining allowable square feet remain on the lot that can be constructed on. The client desires to capture the remaining allowable square feet along with the area of a previously built workshop at the rear of the garage to create a detached accessory dwelling unit on site. Due to the age of the original home and detached garage, having been built in the 1920s, and the unique circumstance of this being a reverse corner lot, we first spoke to the county assessors office to confirm the actual recorded square feet for the address. Completing the bureaucratic within the city planning department we confirmed the setbacks along each adjacent street. The final geometry of the allowable building area is a derivative/manipulation of the allow residential floor area, restriction of lot setbacks and separation between primary building and detached accessory unit.